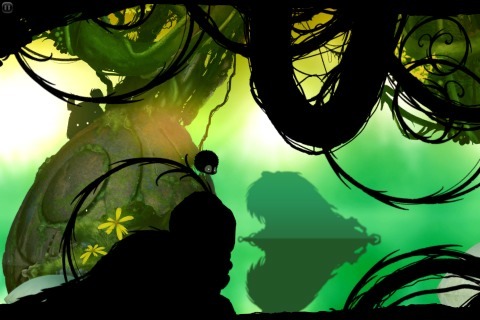 BADLAND is a side-scrolling puzzle/platformer designed for the iPhone. That means simple controls on top of a powerful engine, beautiful graphics, and gameplay designed to be broken out into two-minute chunks. In a lot of ways, I appreciate that. I mean, I wouldn’t be playing it if I had to sit down for an hour at a time. But on the other hand, this makes me miss the more involved platformers of the past. The atmosphere is the most distinctive part of the game. Your character is a circular flying blob in an otherwise-unpopulated world. It appears to be an idyllic land that was turned into the dumping ground of a technological society. You have to maneuver around gears, buzzsaws, bombs, loose pipes, and more (though the main threat is often just keeping up with the scrolling screen). These foreground items are so iconic that they’re shown mainly in silhouette, while the background is defined by a beautiful color palette that changes as the levels progress. 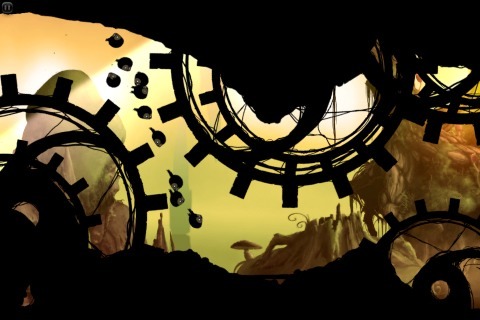 Everything about BADLAND seems designed right. The rules are taught in-game. The difficulty curve is good. The puzzles and unique situations keep things varied and leave no idea undeveloped. It’s memorable, instantly recognizable, and easy to keep playing for just one more round. I like it, but feel like I should like it more than I do. It’s not really compelling. I’m not getting anywhere in the end or finding secrets, and when I put it down, it’s pretty easy to ignore for days at a time. But when I pick it back up, I always remember how fun it is. For today, here are two quick reviews of iPhone arcade games. I wouldn’t quite call them puzzle games, but both are based more around timing and aim than standard arcade elements. Both are also available for free, with in-app purchases used to purchase the whole game if you like the early demo levels. Astronut is a few years old; I remember it being one of the first games to use that in-app purchasing model. In it, you play a sort of base-jumping spaceman who leaps from one rotating planet to the next. Instead of directly moving him, you have to wait for the planet to rotate to the right position and jump at the right moment. This makes the Jump button about the only control in the game, though there is also a “Boost” ability that lets you shoot straight ahead for a time, passing through planets and destroying enemies. As it was made by the design experts at the Iconfactory, you’d expect Astronut to handle this simplicity well. It does, to an extent. The game is quick to learn, and the different kinds of monsters are planets you encounter are all easily recognizable. It’s enjoyably cute, without being busy or distracting. However, the controls aren’t as elegant. In a game in which one basic action is used 95% of the time, I’d expect to be able to just tap the screen to use it. Instead, both Jump and Boost are accessed with little buttons in the bottom corners, and the rest of the screen is a giant pause button. It’s easy to pause this by accident, which is really frustrating in a timing-based game. The goal of the game is simply to dash forward to the end of each level, and it’s fun when everything goes right. But sometimes it’s annoying how easy it can be, as most enemies only hurt you when you’re in space, and most planets in the early levels let you hang out on them harmlessly as long as you want. Your Boost power takes time to recharge after each use, but that’s not actually a problem. On the other hand, it can feel difficult sometimes, because timing your jump can be difficult. But failing in that just feels arbitrary, rather than a punishment for a mistake. This arbitrariness is largely because, if you jump farther than a short hop, your character starts to drift in space, spinning wildly but attracted by the gravity of nearby planets. The game encourages this (long hang times are even worth points), but whether you land safely or not is completely left up to chance. Especially when later levels add barriers to bounce off of and planets that push you away, sometimes it just feels like watching a pinball bounce around. A pangolin is a scaly tropical anteater, but you don’t need to understand that to play Pangolin any more than you need to recognize a hedgehog to play Sonic. The animal’s one relevant feature is that it rolls up into a ball when threatened. Here, your character spends the whole time in ball form, trusting you to bat it through an obstacle course. You have a limited number of shots to make in each level, but because the pangolin is almost always flying through the air, it’s much more hectic than golf. Also, you’re rewarded for finishing with shots remaining and for picking up the coins and gems on each level. That gives each course multiple levels of difficulty: First you can try to make it to the end at all, and then you can try to redo it better. Thanks to this, even the free teaching levels offer a good deal of challenge and replay value. To bat the pangolin around, you tap two fingers on the screen to make a platform it can bounce off of. The position and angle matter a lot, of course, and even the distance between your fingers determines how much force the bounce will have. As you can imagine, this is easy to mess up, especially since the pangolin’s constant movement means that the view you’re trying to tap on is always scrolling by. However, the difficult aiming never becomes as annoying as Astronut. Most importantly, it’s because levels take under a minute each to complete. Retrying a shot that happens ten seconds into a level is hardly frustrating at all. Also, Pangolin lets you restart the current level by swiping your finger to the right. I was suspicious of this non-standard UI control at first, but it really works. Before long, restarting after a mistake becomes so reflexive that the action never stops at all. 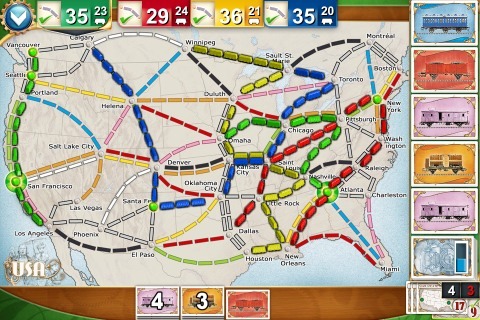 It’s actually easy to retry than it is to leave the game, which makes this dangerously addictive. Once I do stop, though, Pangolin’s addictive hold fades. It’s simple and repetitive enough that I can go days without thinking about it again. The next time I do try it, though, I’m always surprised by how immersive and fun it is. It has a unique cartoony appearance (I especially like the textured look of the backgrounds), a physics model that feels very natural (among other things, it lets the pangolin hug the insides of curves, which is necessary for a lot of the moves in the game), and challenges for different skill levels. I’m looking forward to having more level packs to buy in the future.